This weekend, I concentrated on difficult birds of the Front Range. Saturday I met Gary Matthews and Judy Wright in Estes Park to try for Three-toed Woodpeckers and N. Pygmy-Owls that had recently been seen in the Cow Creek area of Rocky Mountain National Park. Gary Mathews birded Texas with me in Jan 2005, on a phenomenal trip that netted 6 ABA lifers for me. He’s also going with me next week to Northern California to try for the Brown Shrike. Both Gary & Judy have spent a whole lot of time in RMNP birding the last 10 years. We dipped on Three-toed Woodpeckers, but added four year birds highlighted by this little guy! On Sunday Peter Gent and I went out to fill in some holes in the year list. In Anthem Park, Broomfield we found about 200 gulls. Mostly Ringers, 9 Herring Gulls and a 2nd cycle Lesser Black-backed Gull, one of my favorite large gull species. An appreciation for the bird that was only heightened by the difficulty in finding them while filming for The Large Gulls of North America! Linda and I traveled to Boulogne, France to film European gulls hard to find and film in North America-primarily Yellow-legged and Lesser Black-backed Gulls. In Boulogne there were several Yellow-leggeds around as well as some adult Lesser Black-backeds, but by early January the young Lessers were gone, apparently drifting south. I finished up shooting the gulls shots I needed in Boulogne and raced south. Whizzing past Paris on the freeway system at over 100 miles per hour. I told Linda that if necessary, we’d go all the way to Portugal to get Lessers. Linda was a good sport on that trip, spending 5 days on the commercial fishing docks of Boulogne (surely the ugliest city in France) and then getting a 30 minute glance at downtown Paris. Anyway we found a few 1st cycle Lesser Black-backeds at Les Sables-d’Olonne, France and had an enjoyable time. Jon Dunn, Larry Rosche and I agreed that 1st cycle Lesser Black-backed Gulls were a “Birder’s Bird” They didn’t leap out at you, you had to use your power of observation and learn the field marks. Almost an iconic symbol of the whole point of the Advanced Birding Video Series. 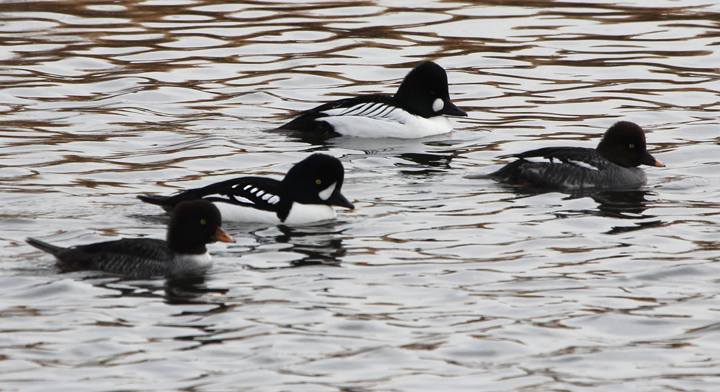 Anyway, Peter and I found three more first-of-year birds including these cooperative ducks! 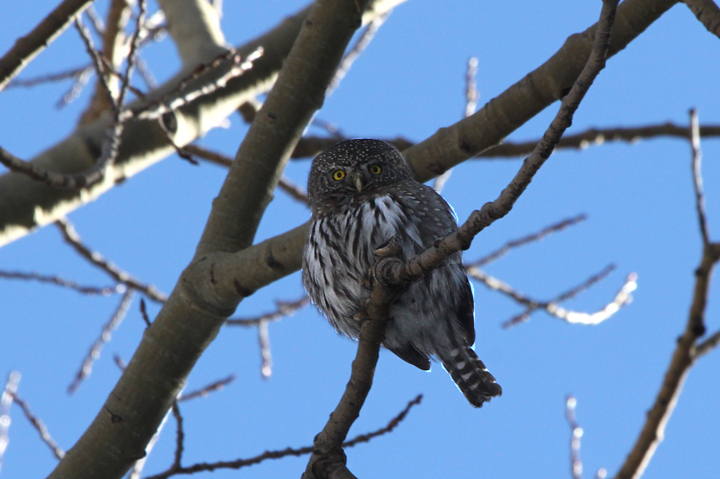 This entry was posted in Blog and tagged Barrow's Goldeneye, N. Pygmy-Owl. Bookmark the permalink. is that your first Pygmy Owl in Colorado? If not, in Rocky Mountain National Park?